two bitter herbs and a roasted egg. In keeping with this year's theme of combining traditional with modern, I chose to shake up Seder menu. The hubby had our own Seder on Monday night and had a lovely Passover dinner with family on Tuesday. For our meal, I wanted to cook something new and decided to turn to one of my newest cookbooks. Joan Nathan's Quiches, Kugels, and Couscous is a wonderful book about Jewish cuisine in France. I'll call it a book - more than a cookbook - because of the wonderful stories and history that accompany the recipes. After reading through a number of recipes I chose Membre d'Agneau a la Judaique (Roast Lamb Jewish Style). Joan describes the origin of the recipe was from a 1656 cookbook and that this was one of the first known uses of "Judaique" or "Jewish style" in a French recipe. This recipe gave me an opportunity to use the tin of anchovies I impulsively purchased in my Passover shopping spree. And since the anchovies are chopped and tucked into the lamb to melt away, the hubby wouldn't even notice! 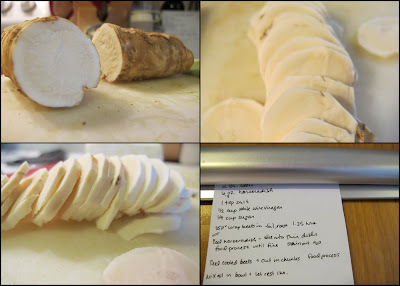 Also new for the Seder was homemade horseradish, which was used in my new Passover deviled eggs, and New England style charoset. I went into my files of saved magazine recipes and found a Cooking Light recipe for a New England charoset that used concord grape wine, maple syrup, and cranberries. Perfect for a local food enthusiast like me! Recipes for the horseradish and deviled eggs were already posted, here I'll include the recipe for lamb and charoset along with a photo recap of all of our dishes. Fresh horseradish - I don't think I'll ever buy it again! The beautiful bright red of the beet horseradish made equally beautiful horseradish deviled eggs topped with parsley! After all these delicious appetizers, we still had room for the lamb. The recipe called for a top round or shoulder roast of lamb. I wasn't able to find that cut at my store, so I substituted a boneless leg roast of the same weight. This recipe was from a Cooking Light magazine clipping I saved from back in 2003, celebrating local New England ingredients. I like chunky charoset, so I did not finely dice the apples, mince the cranberries, or grind the walnuts. Adjust the size of the cuts for your preferred consistency. Passover Eats: Part 3 will cover recipes good for Passover or any time of the year. Stay tuned for matzoh balls, roasted turkey breast with fresh sage and orange, roasted green and white asparagus, and almond macaroons. And don't miss Part 4 - a Passover edition of snack dinner from the hubby. I love your sedar & matzah plates! So pretty! Not to say that the food isn't gorgeous as well, of course! Your Passover dinner looks delicious. - Passover is one of my favorite food holidays because Rafe's stepmom makes her matzo ball soup - its the best I've ever had. It's got lots of dill in the broth and the matzo balls.....sooo good. I'd love to try this lamb recipe - looks great! The fresh horseradish sounds SO good! Good Day, Your idea is really great,I'll come back to see more of your work. Countdown to Passover: Event, Recipes, and More!